Roughly a quarter century after the end of the Soviet era, Russia retains substantial influence throughout many parts of Central and Eastern Europe. Indeed, Russia is widely viewed by the region’s Orthodox Christians as an important counterweight to Western influences and as a global protector of Orthodox and ethnic Russian populations, according to a new Pew Research Center survey of 18 countries in Central and Eastern Europe. Majorities or pluralities in nearly all Orthodox-majority countries surveyed agree that a strong Russia is necessary to balance the influence of the West, and that Russia has an obligation to protect Orthodox Christians and ethnic Russians outside its borders. This sentiment prevails even in the three Orthodox-majority countries surveyed that are members of the European Union: Bulgaria, Greece and Romania. But pro-Russia sentiment tends to run strongest in former Soviet republics that have Orthodox majorities and are not in the EU, including Armenia, Belarus and Moldova. Support for Russia’s geopolitical and religious role is noticeably weaker in Ukraine, an Orthodox-majority country that is still engaged in conflict with pro-Russian separatists in the eastern part of the country following Russia’s annexation of Crimea in 2014. In addition, people in Catholic-majority or religiously mixed countries in Central and Eastern Europe, such as Poland and Hungary, are much less likely to support a strong role for Russia. Excepting Ukraine, support for Russia’s role is widespread throughout the other Orthodox-majority countries we surveyed. For instance, seven-in-ten or more people in Greece (70%), Belarus (76%), Serbia (80%), Armenia (83%) and Russia itself (85%) completely or mostly agree with the statement, “A strong Russia is necessary to balance the influence of the West.” Further analysis shows that people who agree that conflict exists between Western values and the traditional values of their own country are more likely than others to say a strong Russia is necessary to balance the influence of the West. There also is a prevalent view among Orthodox Christians that Russia has an obligation to protect Orthodox populations internationally. In every country surveyed with an Orthodox-majority population, other than Ukraine, most say they agree with the statement that “Russia has an obligation to protect Orthodox Christians outside its borders.” Majorities of every Orthodox population surveyed in countries other than Ukraine also say Russia has an obligation to protect ethnic Russians around the world. Russia is also viewed as a seat of Orthodox religious authority. Among Orthodox Christians, the patriarch of Moscow – who is the head of the Russian Orthodox Church – is more widely viewed as the highest authority in Orthodoxy than is the patriarch of Constantinople, despite the latter position’s traditional status as “first among equals” among Orthodox leaders. 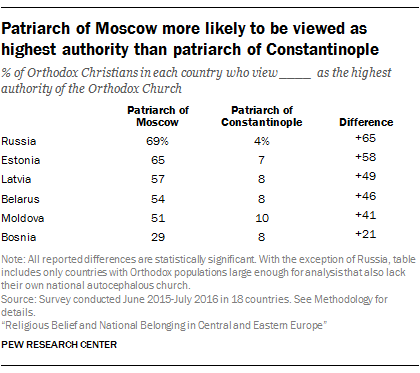 In fact, in every country that has a sizable Orthodox population but lacks a self-governing national church, people are much more likely to say they view the patriarch of Moscow as the highest authority in Orthodoxy. Not surprisingly, a majority in Russia (which has its own national church) also views the patriarch of Moscow as the highest Orthodox authority. In four of the six countries surveyed that do have their own self-governing churches – Georgia, Serbia, Romania and Bulgaria – most people say they view the leader of their country’s national church as the highest Orthodox authority. Only in Greece does a majority view the patriarch of Constantinople as the highest authority in the Orthodox Church. Pro-Russia sentiment notwithstanding, Orthodox Christians widely agree with other Central and Eastern Europeans that their countries should have close relationships with the United States and other western powers. Majorities or pluralities say this in every country surveyed. This is even true in countries that favor a strong Russia. For example, a majority of adults in Armenia (66%), Greece (62%) and Serbia (61%) say it’s in their country’s interest to work closely with the United States and other Western powers. That said, sentiment was split when Pew Research Center asked people in former Soviet republics whether it was more important for their country to have “strong ties” with the European Union or with Russia. Russians were not asked this question, but in three of the five Orthodox-majority countries where it was asked – Armenia, Belarus and Moldova – majorities or pluralities say it’s more important to ally with Russia, while Georgia is roughly divided on which is more important. In the former Soviet republics surveyed that do not have Orthodox majorities, adults are much more likely to say it is more important to have strong ties with the European Union over Russia.